I recently spent a week on a gastronomic tour of Tuscany, timed to coincide with the annual white truffle festival in San Giovanni d’Asso. 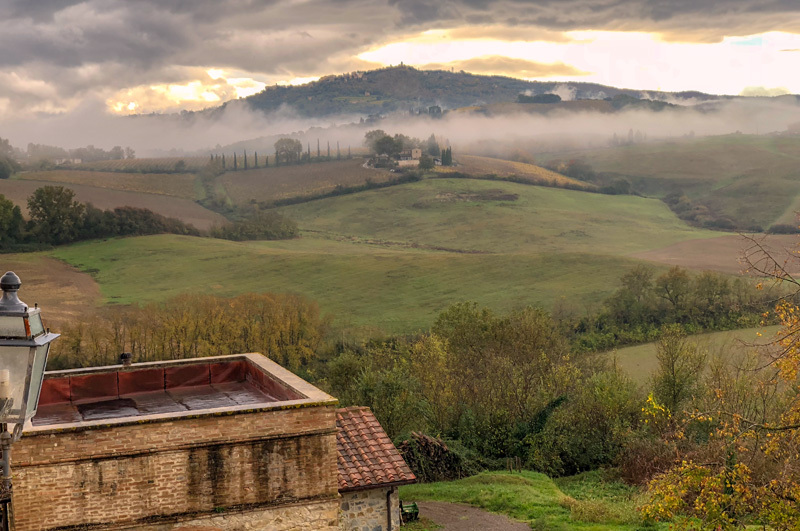 My base for the week was the Poggiarellino Brunello wine estate at the base of Montalcino, and this – unbelievably – was my view each morning as we gathered to head out for the day’s adventures. And head out we did! In six days we zig-zagged across the southern Tuscan terrain in the Crete Senese and Val d’Orcia areas, visiting wineries, farms, and restaurants. 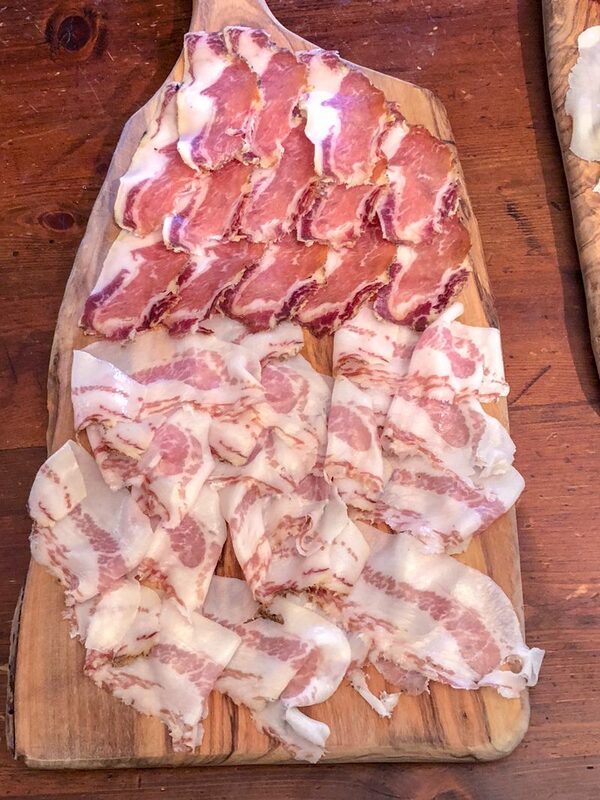 I’m going to write a series of posts about the experience, starting with the famous Cinta Senese pigs. You’ll know this breed by the white belt, but we almost lost them entirely. 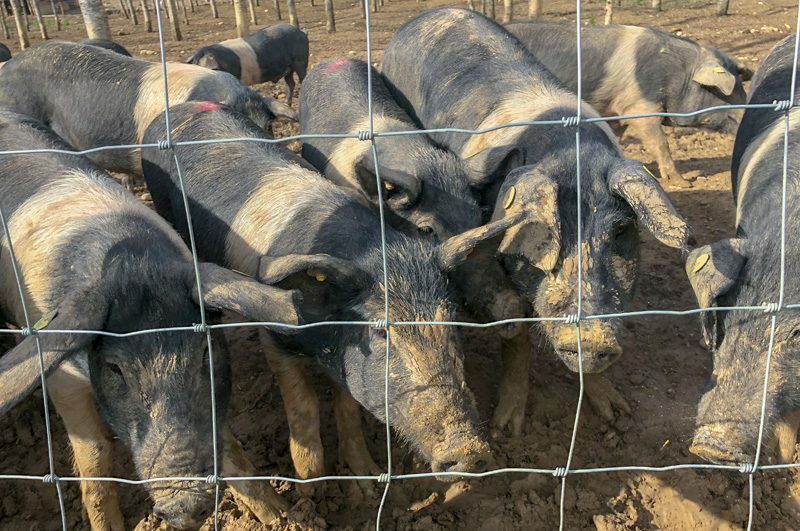 A rustic breed that fattens quickly and therefore needs to roam to control the fat, at one point there were only three farms left raising these animals. They are a special breed indeed. 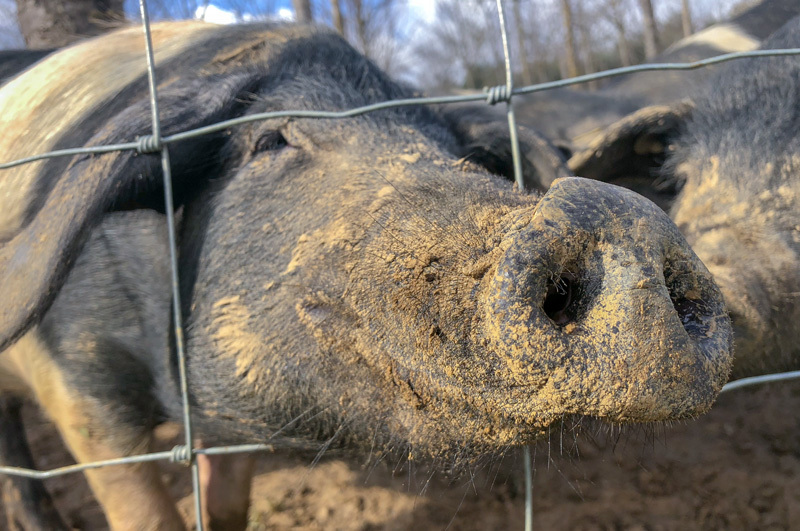 They take two years to mature, compared to the average 8-10 months for a white pig, and there are only 4,000 Cintas raised each year versus 17 million white pigs. In 2001, a consortium was established to protect the quality of the breed, and it governs everything from land per animal, to feed (only local Tuscan cereals, no GMO, no soy, must graze free), and more. The Cinta is the only animal (as opposed to food product) in Europe with their own DOP, after a great amount of work to prove the breed is being raised today like they were 100 years ago. 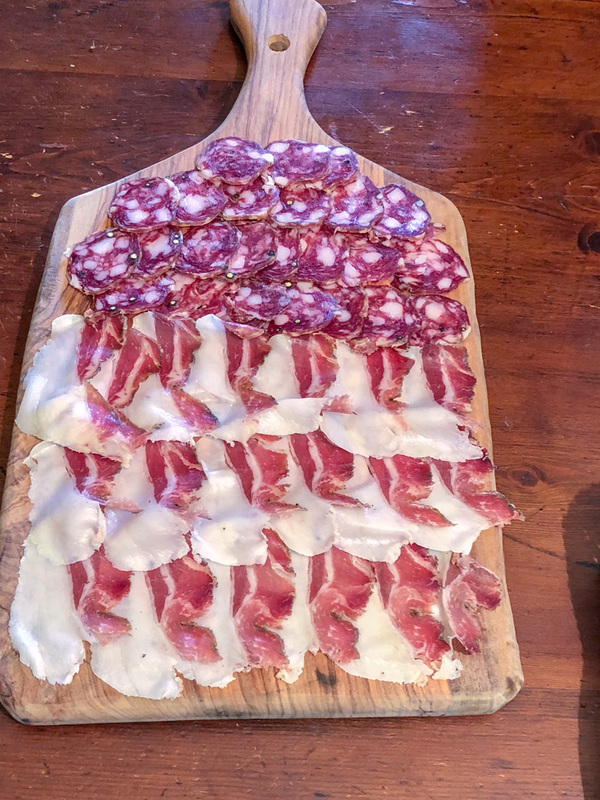 Daniele Baruffaldi, our host for the education and tasting, is closing his farm for a couple of years to allow the land to recover from the pigs grazing, but he’s still very involved in the consortium. He explained that the fat of the Cintas melts at a lower temperature than white pigs, meaning it can melt in the human body and is digested more like a liquid fat than a saturated fat. All that grazing also means the Omega 3 content is higher. Now who doesn’t like to be told that they are eating a healthier pork product?! 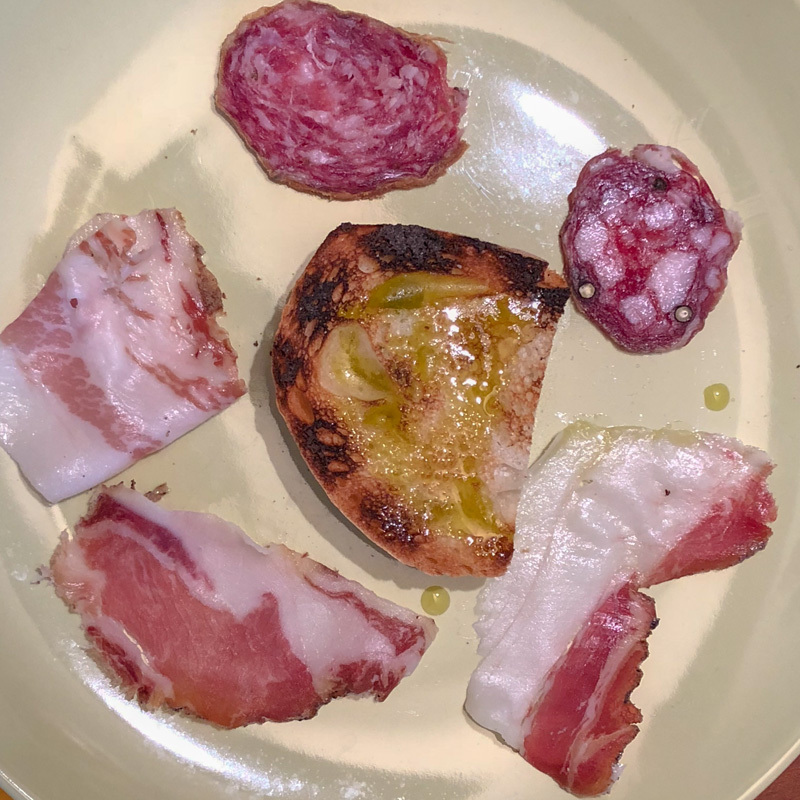 We enjoyed slices of Guanciale, Copa, Salame, Fileto Arista, and Finocchiona, served with bruschetta Daniele roasted over his open fire of his farmhouse kitchen. Of course, there was fresh olive oil from this year’s harvest, something that would be a theme for the week. 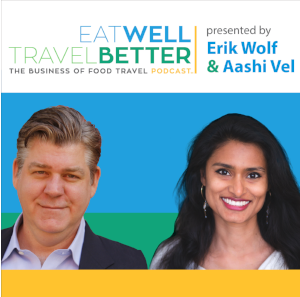 Toasty bread, melting with pork fat, listening to a humble and generous Italian man share his passion – it doesn’t get much better than that!